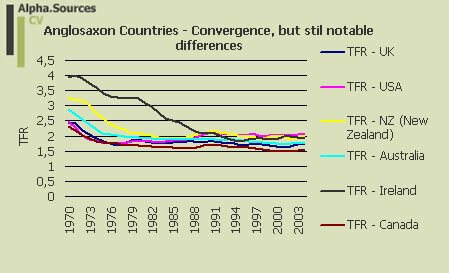 As promised I am going to feature tables of TFR rates in OECD countries from 1970 to 2004. In this entry I will show graphs which show the overall stylised facts in selected groupings of OECD countries. I have also uploaded the .excel file so that you can play around yourself; I have also plotted the individual countries' TFR rates single graphs for ultimate flexibility in data presentation. All the graphs are based on the raw OECD .excel data sheet from the recent 2007 Factbook which also means that the groupings of countries featured below are my emphasis and interpretation. Let us begin with the evolution of total fertility rates in OECD as an average during from 1970 to 2004 shown in the figure below. You do not get a much better picture of the demographic transition in the developed world than this I imagine but as we shall see there are notable differences between countries and regions which of course makes the macroeconomic analysis and conceptualization more difficult. Nobody of course knows how far fertility can and will drift down but there does seem to be some kind of stabilization at 1.6 children per woman aged 15-49 in the aggreagte OECD figure from 2000 and onwards. Note of course also that this figure does not take into account the different sizes of the countries and thus different contribution to the average population level in the OECD. Moving back to the TFR rates however there are as mentioned differences and they are very important to pay attention to. Let us first look at the anglosaxon (English speaking) countries which are doing a good job keeping the OECD aggregate TFR level afloat. Here of course the TFR rate in the US just about at replacement levels should be noted. The convergence process from the 1970s and onwards is also interesting to note and especially that this convergence process coincides with notable divergence at the end point. Lastly, the convergence process itself shows that countries move through the demographic transition in quite different tempi and also as noted with different end points. Next, let us have a look at continental Europe where the overall convergence process is even less marked and thus also hides important divergences; note for example the difference between France and Germany. France, Belgium and the Netherlands are all above the 1.5 level with France close to 2.0. Conversely, Germany, Austria and Switzerland have converged close to the dreaded level of 1.3 which signifies lowest-low fertility (i.e. the fertility trap). Moving on to southern Europe we see a distinct process of convergence towards lowest-low fertility. In terms of macroeconomic fundamentals immigration is very important to take into account here especially in Spain where the pickup in fertility rates from 1998 and onwards perhaps can be attributed to a positive fertility component from immigration. However overall, the fertility situation looks fairly dire in the southern parts of Europe. And while we are in Europe why don't we take a look at Eastern Europe. The picture is of course incomplete but given the general level of development and their place in the global value chain the general fertility levels in this region should be the cause of much worry amongst the policymakers. It is thus most worrying to see these countries move through the demographic transition at a pace which is clearly not in sync with the pace of economic development. On the second last graph we have the Nordic countries where fertility levels are generally higher than in the rest of Europe and close to replacement leves albeit somewhat (1.7+) lower for all countries except Iceland. Perhaps most interestingly the evolution in fertility is considerably more volatile than in other OECD countries. Note for example Denmark's pick-up from 1980s to the current level of TFR at about 1.8 and also Sweden has seen a pick-up from 1998. Lastly, I am featuring a graph of a comparison I have often made between the three oldest countries in the world (measured by median age), Germany, Italy and Japan. As we can see from the graph all three countries are firmly set with fertility levels below 1.5 and close to lowest low fertility of 1.3. Fertility levels can tell us a lot but by no means everything. Especially, the net migration rate is an important input to the full comprehension of the overall population dynamics in the individual countries. Moreover, the way fertility is treated above also does not take into account to cohort perspective. As such, it is important task to divide the fertility levels into more specific periods to really get a full picture. For example the periods 1970-80, 1980-1990, and 1990-2004 reveal notable differences in average fertility levels and as such y-o-y fluctuations in fertility rates are not very useful in themselves. I have begun the calculations on these periods in the .excel document linked to above. In the end however I hope that you have found this useful anyways and pleaes do feel free to use the data and graphs fore further study. More specifically I recommend you to download the .excel file and have a look at the data set. You never know when a paper comes along which demands the use of one of the fertility tables above. Of course you will also be able to customize the table design as you see fit from within the .excel file.